The island of Crete is an 8,251-square-kilometre Greek island located in the Mediterranean. It is situated south of the Aegean Sea (between Europe, Asia and Africa) It is the most southern area in Europe and the largest of the 1,425 Greek Islands. There are 632,000 inhabitants of whom 140,000 live in Crete’s capital Heraklion (Iraklion). Majestic mountains surround the 1,050 kilometers of beautiful coastline. Crete’s economy is fuelled by agriculture, tourism, and industry. The island of Crete has something for everyone. It is a place steeped in tradition but also embraces modern life. The people of Crete are friendly, laid back and very proud of their heritage. There are bustling crowds in many areas but also quiet, remote areas where you can get away from it all. Mountain goats and sheep wander freely and sightings of these are a common occurrence. If you are a beach lover then you should consider the kilometers of beautiful beaches. 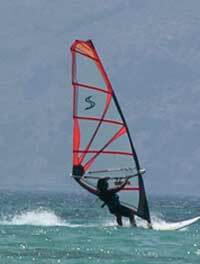 Opportunities for swimming, snorkeling, diving or windsurfing, and cycling abound. There are ancient ruins to discover. If you are an adventurer interested in hiking over cliffs or mountain climbing then Crete has that too! It is believed that the first inhabitants of Crete came from little Asia or North Africa and lived on the island 7000 years ago. Crete had the first advanced European civilization more than 4000 years ago, the Minoans, a people who flourished from 2800 to 1450 BCE. 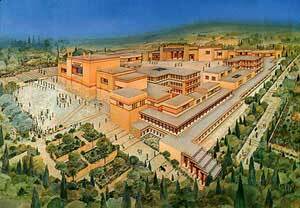 The Minoans had such a powerful navy that the palace at Knossos needed no fortifications. They were known for their brilliant painting, sculpture, and mosaics, and for the prominent role that women played in their society. When this civilization declined, Crete was invaded by all of its neighbors in turn, starting with the Myceneans of mainland Greece, followed by the Dorians and later the Romans. The fall of the Western Roman Empire put Crete under the rule of the Eastern Byzantine Empire. The Arabs invaded and conquered Crete in the 8th - 9th century. Eventually, it was sold to the Venetians in the early 13th century. The Venetians ruled until 1669 when the island surrendered to the Turks who ruled until 1898. In 1913, Crete was officially a part of Greece. There are many stories about Crete in Greek mythology and it is often referred to as Zeus’s island. According to legend, Zeus was born in a cave in Crete. He later became the ruler of the Gods. Under King Minos, from whom the Minoans take their name, the island was the site of the labyrinth and the home of the dreaded "Minotaur" -- half-man, half-bull -- slain by the Greek hero Theseus. 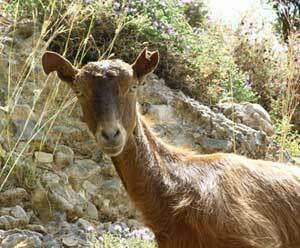 Inquisitive goats, like this one in Sfakion, are to be met throughout Crete. There are 300 days a year of sunshine in Crete. It has a typical Mediterranean climate with short springs, long hot summers, and mild winters. The average temperature in Crete ranges between 12-17 degrees Centigrade (54 - 63° Fahrenheit) from November to April and 30-40 degrees C (86 to 104° F) from June to September. It is in these months that sunshine averages 12.5 hours per day. Although most tourists prefer June to September, Crete can be quite beautiful in the winter months with its snow-covered mountain tops. If you want to avoid the crowds, May and June are the best months to visit. The temperature averages 27 degrees C (81° F) during these months. 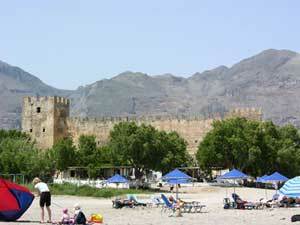 If hot and humid is to your liking, as well as loads of tourists, then August would be an ideal time to visit Crete. Most major airlines fly to Crete. Delta, American Airlines, Air Canada, British Airways, Air France all offer flights. It can take up to 18 hours depending on where you’re flying from. If you choose you can get to Crete by sea. There are two main companies that connect Chania and Iraklion to mainland Greece, ANEK and Minoan Lines. The City of Chania is located on the west side of Crete. 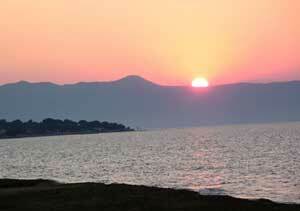 It has 52,000 inhabitants and is about a half hour drive from Platanias. 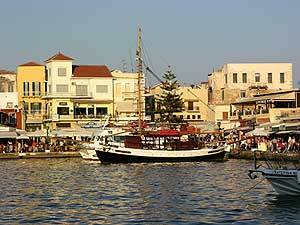 Chania boasts the Venetian Harbour, the old port, the narrow shopping streets, waterfront restaurants. It is lovely, especially the harbor. 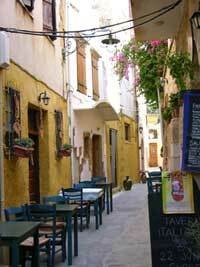 It has an exciting nightlife so if that is your preference Chania is ideal. Heraklion is an hours drive east of Chania. It is Crete’s largest city, with a population of 120,000, and its capital. In the central square you’ll be impressed by the Fountain of Lions, which is surrounded by cafes, stores and restaurants. While in Heraklion (Iraklion) pay a visit to Knossos and the Archaeological Museum. Knossos is located on the north coast close to Iraklion. A visit to Knossos (Cnossos), the ancient city of Greece is like going back 4000 years in time. Knossos has the finest Minoan ruins in the world. The Archaeological Museum of Herakleion (Iraklion) on one corner of the central Eleftherias Square holds many of the finds from Knossos and many other archaeological sites in Crete. The museum spans a period starting several thousand years ago, through the Minoan, and later periods. Some interesting items include Hellenic and Roman sculptures, jewelry, wall-paintings, and pottery. Gramvousa with a population of only 917 is considered the best major attraction because it encompasses all that is Crete! It is a day trip (13 hours) that includes a hike, beautiful beach, and ancient ruins. The peninsula of Gramvousa occupies the northwest of Crete and near its tip, it has two islands, a good beach and the remains of a large Venetian castle. The boat trip is one hour long and the views of the rugged coastline are fantastic. The hike can be fairly challenging during the summer months, because of the sun and heat. This island has a beautiful clean beach with small pebbles. The highlight of the trip is the fantastic Balos Lagoon where you can enjoy unforgettable swimming in the crystal clear turquoise waters. It was apparently a honeymoon spot for Prince Charles and Lady Diana and once the haunt of pirates! You can reach the island from Kastelli on an ongoing basis every day. If you get to Kastelli, via public bus or car you can take a ferry from that point. You may opt to go to Gramvousa via an organized boat trip from Chania or another major port. There are many organized tours to choose from. The Gorge of Samaria is located between the White Mountains and the Volikas Mountains in a beautiful national park. It is thought to be Europe’s longest gorge at 18 km (11mi.). There are high mountains, small streams and flowers, and Cyprus trees. The tour begins about 1200 meters (3937 ft.) upon Omalos plateau. It starts off downhill and there are plenty of stones the entire way. Good shoes and normal good condition are required for this long trek. 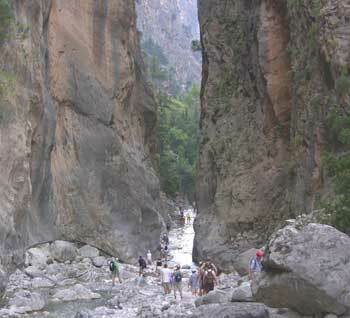 A day trip though Therisso Canyon is a great alternative to the gorge of Samaria tour. It lies 17 (10.5 mi.) kilometers south of Chania and is only 12 kilometers (7.5 mi.) but nevertheless beautiful. 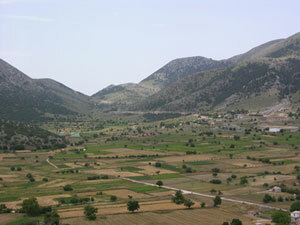 Therisso was a base for rebels and revolutionaries under the Turkish occupation. 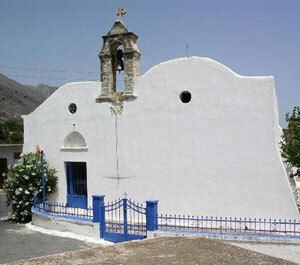 There are also museums and houses in the area where the leader of the revolution Elef Venizelos lived. The Geraniotis Beach Hotel-Apartments is a popular middle-class hotel with a beach on the outskirts of Platanias. It is a fairly quiet hotel with a good mix of young people, families and senior citizens. The beach is sandy but once you wander out to the water be prepared for stones! Apparently, turtles come to hatch their eggs on this beach. The hotel consists of two buildings and there is a children’s pool and adult pool with well-maintained grounds. There is also a restaurant, bar and playground. The rooms are for two people with a shower and toilet, (bathtub optional), telephone and balcony or patio with a waterfront view. There is also air conditioning. The building was built in 1987 and there are 120 rooms. There is fairly heavy traffic outside of the hotel. So it could be disturbing for those who get a room close to the street. Hotel Sunshine is a small hotel/apartment complex that’s popular among families and is located close to the three good beaches in Agii Apostoli. It is 300 meters from the beach. In the hotel, there is a TV room, pool, and bar. The apartments are for 2 to 4 people with a bedroom and living room, mini kitchen, toilet with shower and a balcony or terrace. There is no restaurant at this hotel but there are plenty within walking distance. Most of the hotels use solar panels to heat up the water. That means that you can only count on hot water in the late afternoon/evening. However in many of the larger hotels hot water is available day and night. NOTE: Do not throw toilet paper into the toilets. Place toilet paper into the wastepaper basket. The pipes on Crete are very narrow and therefore easily clog up and overflow! The Frangocastello Fortress was built in 1371 to protect the nearby bay from pirates. Avoid the tourist traps in the downtown Platanias. Head for the small quaint restaurants, taverns and cafes in Cretan villages on the outskirts of town. A rule of thumb is when in Crete do as the Cretans do. So keep a lookout for the local folks. The Greek diet is tasty and healthy! Oranges, lemons, grapes, olive trees and much more grow abundantly on Crete. Crete Island is said to produce one of the best olive oils in the world. Crete has the lowest percentage of heart and coronary diseases in the world. The Greek kitchen is mostly known for its traditional moussaka, souvlaki, tasatskiki, and Greek salad with feta cheese. Try the Pergyros restaurant just a short walk up from The Geraniotis beach hotel. It also has a large children’s playground. Highly recommended, with an incredible view of the sea and great food. Many restaurants hold a Cretan evening. It is an evening of traditional dance, music good food, and drink where you can experience the culture of the island. You will be entertained by local Cretan dancers and musicians who perform in local costumes and guests are encouraged to participate in some dances if so desired. Valid passport only. More importantly, your passport must be valid for a minimum of three months beyond the end of your projected stay. This is true for many countries, not just Greece, and it is a good idea to never travel on a passport with less than six months time left on it. No special shots are necessary for entry to Greece. The island has a clinic, though lines can be long. The water in Crete is safe to drink. Crete has one of the lowest crime rates in Europe, but like everywhere else there is always a risk. Do not leave your luggage unattended in public areas and never accept packages from strangers. Earthquakes are infrequent but do happen. Foreign currencies can be exchanged for euros at the large banks (closed weekends) in Platanias, Georgioupolo and Chania. They are open Monday to Thursday 8 am - 2 pm and Friday 8 am - 1 pm. There are ATMs located all over and most restaurants take Visa, MasterCard and American Express; however, they will often take a surcharge of 4 to 8%. Crete is not cheap! Prices have soared especially since the introduction of the Euro. You will find that the cost is similar to that of many western countries. Greek locals speak a lot of English and some German. NOTE: Siesta time is from about 2 pm to 5 pm each day. Some shops are open, however, to accommodate the tourists. Many are open on Sundays and late into the evening. There is internet access in many of the big hotels and Internet cafes in most areas. Prices can run from 3 to 5 euros per hour. In Platanias, there is internet access at Club Tropicano Internet. In Chania, there is a charming internet café called Kathodon, in the center of the old City of Chania and situated only 10m from the very famous Old Harbour. They are very friendly and provide a map where you can indicate where you came from in the world with a thumbtack. You can choose to rent a car, motor scooter or bicycle. 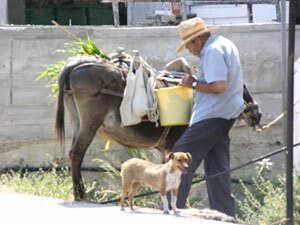 When driving in Crete it is customary and expected to allow others to pass by moving over to the shoulder of the road. The island is mountainous and most roads are narrow and curvy. Gasoline costs approximately 1.80 euros per liter on Crete. Taxis operate day and night and are fairly inexpensive. When taking a taxi, the rate per kilometer starts at 0.30 euros, depending on the time of day. The minimum fare is 1.75 euros. You can take a taxi from Chania to Platanias for approximately ten euros. Greece has a national bus service called KTEL. There are good bus connections over the entire island. You can take a bus from Platanias to Chania for approximately 2 euros. COST: 60 euros for 2 days (with unlimited mileage and full insurance and delivered to your hotel if you wish). NOTE: There are mosquitoes but you can purchase a mosquito repellent (oil) that you can plug into your hotel socket. It can be purchased at most convenience stores. Jennifer Wattam is a student and a film person. She is a Canadian who resides in Helsingor, Denmark.